So, I have to click on unlock widgets to continue. There’s a template for Development Activity, so I decide to base it off that template first. I didn’t see anything awesome about that template. Also, all of my programs were in both activities. That’s not quite as helpful as I’d thought they’d be. I can’t figure out how to delete the development activity. Maybe I need to stop it first? Yup, once I stopped it, I was able to delete it. Well, let me take a look at the options, maybe there’s something I need to set in the KDE settings. (As a side note, the cashew from my left monitor has disappeared.) I could not find anything in the settings. I went ahead and made a Programming Activity based on an empty desktop. Right-clicking on the top bar of my programs shows that they are set to all activities. I’m going to set everything to main and then start a new program and see what activity that starts in. I was unable to get Chrome there. But that’s OK for now. What I *do* like is the ability for something to be in all activities, just like you can have a program appear in all virtual desktops. Makes it easier for me because the screenshot tool will be in all activities. I’m happy to report that music plays no matter what activity you’re in. (At least with Amarok) I open up KMahjongg and, happily it is only visible in the current desktop. Good, that makes sense. So back to the Programming Activity. I open up Kate. I would want to have the same programs start up every time I open up an activity. I go back to the Main activity and stop the Programming activity. To stop, click the stop button. To change the Icon and name, click the wrench. Oh, quick tip I discovered, Meta-Q (Windows key-Q) brings up the Activities dialog so you don’t have to go to the cashew every time. 1) How do I get Chrome to obey my virtual desktops? It may be the case that I’d probably just want to leave the last virtual desktop on all my activities with Chrome so that I could always have it there for looking stuff up. But I might want to separate that. 2) In KDE 4.6.x, can I have a different number of virtual desktops per activity? I might want two for my programming activity and three for my communications activity. 3) In KDE 4.6.x, can I have different taskbars per activity? I could see wanting to create one in my programming activity, for instance, that contained shortcuts for all the programming programs I might typically run. 4) Is there a way to set shortcuts for switching activities? I didn’t see it in the “shortcut settings” in the cashew. Right now I can ctrl-alt-(arrow key) to get around my virtual desktops and it’s nice and quick. 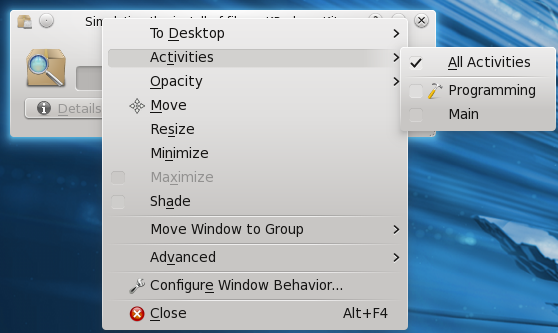 I know part of the point of activities is kinds like Gnome Shell’s “don’t be distracted” paradigm, but for me to really use activities fully, I’d need a quick keyboard way to switch activities. I am one of those who try and do as much as possible without lifting my hands to use the mouse. I GUESS I could switch the mouse wheel to switch activities rather than desktops, but I’d still prefer a keyboard option. So let me know, KDE community, if I’m missing something. So far Activities seem to work just as I imagined when I wrote that previous post. (Linked above in the second sentence) I can still see notifications from my chat programs and music so I’m not in the dark while in another activity, but the interfaces stay out of the way until I’m ready to access them. The KDE team has done a good job. Depending on the answers to my above questions, they may just need a spot of polish to meet all my needs. Good job innovating, guys. You’ve really pushed past the virtual desktop metaphor that everyone other than Microsoft has been embracing for the past 10 years. 1) I think you need to activate the native kwin window decoration in chromium for it to work best with activities.